However, one thing that was a HUGE let down was the way Microsoft dealt with two mainstays of their platform—Solitaire and Minesweeper. These games have been staples on Windows for years, helping to pass hundreds of hours before the Internet sucked up all of our free time. For some reason, Microsoft thought it best to make a quick buck and make them freemium apps, requiring a $9.99/year payment to remove ads. This is just plain ridiculous to me, and after a little digging around, I found a few ways to get the full Windows 7 versions of both of these games for free on your Windows 10 computer. In this guide, I'll cover two methods for bringing back the classics for free. The first only requires you to download an EXE file that will bring back all your favorite Windows 7 games ("easy method"). The second uses the original files from a Windows 7 PC you already own ("hacking method"). You'll get the same results with either method, so pick whichever one you are most comfortable with. First up we have the automated method which comes with the Windows 7 games pre-modified and ready to go. Simply download the linked archive (courtesy of WinAero) below, extract it, then run the Win7GamesForWin10-Setup.exe file. The beauty of this method is that, along with Minesweeper and Solitaire, you can also install FreeCell, Chess, Hearts, Mahjong, and other games. 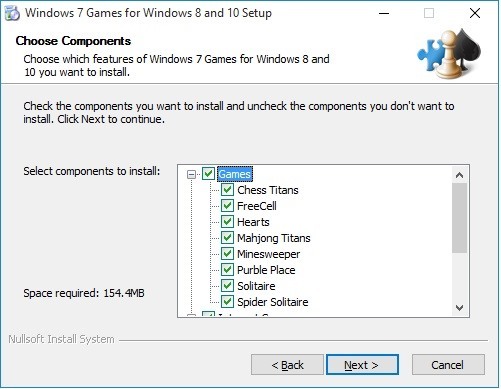 Follow the installation wizard to select the games you would like to have installed on your PC. 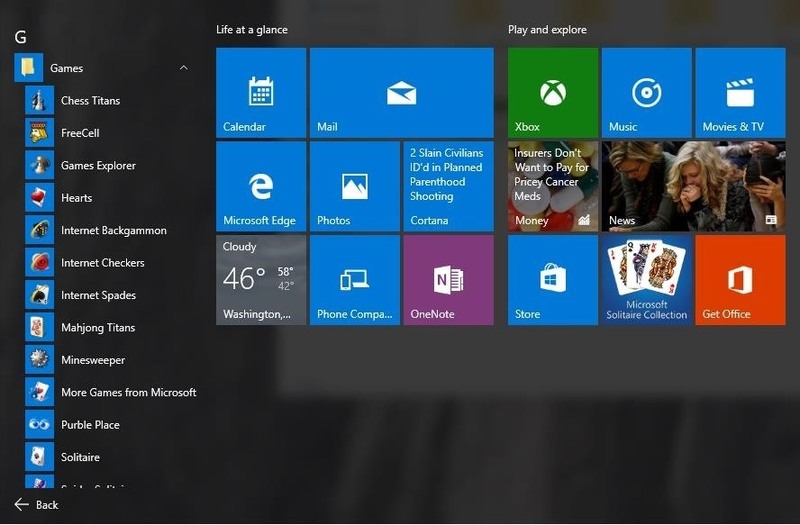 After you hit Next, the games will be installed under a new Games section in your Start menu. This method is for those of you who would rather handle the modding yourselves by extracting and modifying the original Windows 7 games from one of your existing Windows 7 PCs. This means you will need to have a Windows 7 PC, a Windows 10 PC, and a USB drive to transfer files between the two. On your Windows 7 PC, navigate to C:\Program Files\ and copy the Mirosoft Games folder to your USB drive. Next, head to C:\Windows\System32\ and copy CardGames.dll to your USB drive as well. Now plug your USB drive into your Windows 10 machine and copy the Microsoft Games folder to C:\Program Files. After that, copy the CardGames.dll file to each of the folder for Solitaire, FreeCell, Hearts, and SpiderSolitaire. The games are now installed on your PC, but because they run a version check on your system before they open, they will not run just yet. To fix this, you will need to open each game's EXE file with a hex editor like HxD. Since you can't right-click an EXE file and select Open With, you will have to first open the hex editor, then drag-and-drop the EXE file into it. When you have finished patching each EXE file, you'll be ready to start playing. The games will not have their own section in your Start menu, but you can always right-click each EXE file and select Pin to Start. If you have any other hacks or mods for Windows 10, be sure to drop me a line in the comments below, or over on Facebook, Google+, or Twitter. I opened minesweeper.exe with HxD, since I use it first time I did a quick search test for "0E 1F BA 0E" which I can see on screen, and it was successful. then I tried "7D 04 83 65 FC 00 33 C0 83 7D FC 01 0F 94 C0"
I had the same problem. I searched for 7D 04 83 65 FC 00 33 C0 83 7D FC 01 0F 94 C0 using HxD. I also tried searching for portions of the string of hex characters. I was able to find 7D 04, but not the whole sequence. I also tried reversing the sequence. I WONDER HOW TO find out what's wrong. Will someone please reply with a suggestion! It's different for 64-bit versions. Search for the following string: 3b c6 0f 4c. Once you've found the string, you need to replace the first "3b c6" with "39 c0". You can't delete characters in a hex file, so to do this simply place the cursor in front of the first "3b" and then type "39 c0". Thanks so much! One more little "gotcha"... I was not able to make the edit on the file in \Program Files\Microsoft Games. Got "access denied" even though I have administrator rights. However, I got around this... I made another folder under C:\ , renamed the file (not sure if this was necessary), made the edit and saved it, renamed the file back to the original and copied it over the existing version (with administrator rights that worked fine) . Works very nicely! 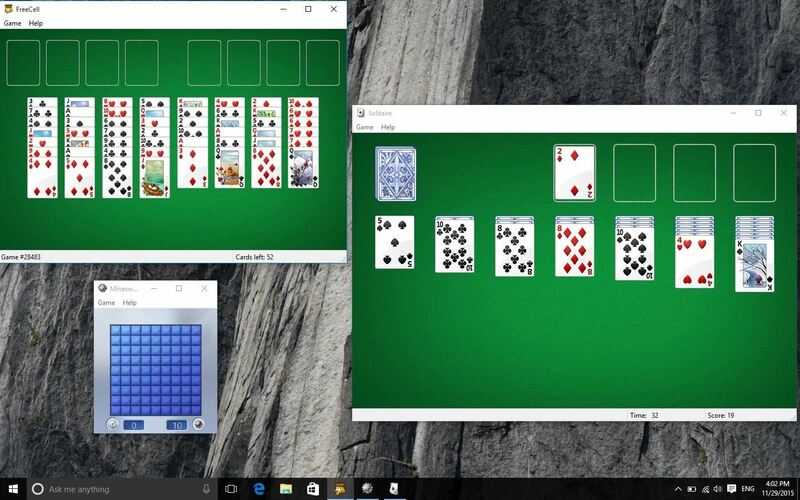 The Windows XP version of Solitaire works without modification on Windows 10! On an XP computer, in Windosw\system32, find sol.exe and cards.dll. Copy these two files to a folder on a Windows 10 computer. You can launch this old version of Solitaire by simply double-clicking the sol.exe icon. I discovered this after Andrew's download failed, and I failed to get either Andrew's or Bosco's hacks for the Windows-7 version described above to work on my upgraded-to-Windows-10 computer. But, in a way, I like this older version of Solitaire even better than the Windows 7 version: It is more like the actual card game in that it doesn't allow cheats (undo plays that exposed previously hidden cards). Seems to be a common theme - I'm trying to find the right line of code in the Hex editor and can't The links to the non-hack method are no longer working - do you have any updated versions which will work? I've been using Windows Vista 32-bit for years on an old laptop. I just installed Windows 10 on a new Partition. I followed the instructions above, copying the game files from Vista to 10. I opened the EXE files and changed the two instances of 7D to EB. However, I still cannot run the games. When I run the EXE files, nothing happens. Hello, just want to tell you guys that the so-called 'classic' Windows games shown in this tutorial aren't really 'classic'... they were released together with Windows Vista, and were developed by Oberon Games rather than in-house by Microsoft like in in previous Windows versions. You can tell with the updated graphics, sound effects and help/hint tooltips: in my opinion they diminished the enjoyment of playing those games. I think there were four eras of the classic Windows games. Microsoft went full retard in Windows 8 and 10, removed the bundled classic games and in 2015 even tried to fleece users with a crappy paid version of Solitaire on the (still pathetic) Microsoft Store). Minesweeper, Solitaire, Spider Solitaire, Hearts, Freecell. The original 5 games.